If you're a salmon fisher contemplating booking fishing on the 'mighty' Tay surely you'd rather be out on the river without having to fit into a 'pool rotation' system because the beat is fully rodded. Surely also you'd want to be in with a chance of a 'real' Tay heavyweight and not just one of these 8 to 14 lbs 'tiddlers' that appear later in the Spring. The Tay has always had a head of Loch Tay bound 'monsters' in it during the early Spring months even though the angling pressure is at best 'negligible' which is one of the downsides of 'catch stat' marketing which often cripples our game and misleads the salmon angling community for various logical based reasons. February & March are the best Spring months if connecting with a pristine Tay heavyweight is your objective. Assuming you get out there here's a few tips on what to do if you get one of these Tay 'beasts' to cooperate. The cold water take can sometimes be a subtle one but within the first few seconds of contact after you set the hook you'll sense something is different. The sheer weight and big head shakes will likely be your first indicator before the fish likely takes off on a power house run! Keep you composure and keep that rod as high as you can as the further that fish moves away from you the more chance there is of your fly line getting drowned which can often be difficult to recover. Assuming the salmon runs to the other side of the pool that high rod tip should keep your fly line up and mostly clear of the water. You don't want the weight of the Tay and a heavyweight salmon adding big pressure onto the fly line as a sudden upstream bolt could easily be too much for the hook hold or leader. Get that rod tip up high and keep it there! A drowned fly line on any fish let alone a serious heavyweight salmon is likely to end in tears! Here's a demonstration of what I mean as this logical anti fly line line drown tactic is seldom discussed or understood these days. After your salmon realises that foreign body that's wedged in its 'chops' was a bad idea it may well take a run down river so you've 2 options if that happens. The first is to stay still and pray that the salmon stops or the second is to 'leg it' downstream after the fish. Assuming the riverbank terrain allows you to follow a fish I personally think that's the best option as there are no guarantees the fish will stop and stay in the pool. The last thing you want is a narrow gaped hook getting head shaken violently by a heavyweight salmon that's taken up a position 100 yards below you as the hook hold will likely pivot round and put a thin layer of flesh between you and freedom as all the hook hold pressure will be coming from an 'out of mouth' direction which is logically never going to be sensible. Always get your salmon side on during the fight if you can and do that with the high rod tip as mentioned above. All big fish have a habit of doing 'exactly what they want' for most of the fight so you need to be patient. Sometimes the fight will be deep and slow moving but more often than not there will be a few big runs thrown into the mix. If a big salmon goes down deep in the pool which all salmon do as a defence mechanism try to get a downstream position and try and move it out of the depth. At the bottom of most pools there are sub surface obstacles that a big wise old salmon will try to use to rub a hook out of its mouth so do your best to turn your fish out of there with plenty of 'downstream positioned' side strain pressure. 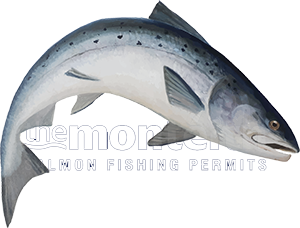 While it may feel like an eternity all salmon will eventually tire but you have to be patient with a big fish especially if you're fishing on your own and there's no one around to assist with the landing procedure. I recall on two occasions sweat dripping off the end of my nose at the 30 to 45 minute stage of battle strain created by 2 memorable Tay heavyweights that I was playing on the fly rod. If there is someone there to assist don't let them pressure you through the excitement of it all by standing prematurely in the river between you and the fish poised with the landing net when the salmon is still 20 minutes or more away from being ready. An experienced ghillie or angler won't get the landing net ready until the time is right as it adds unnecessary pressure at a critical stage of the fight which is not necessary and can often end in disaster.